The College of Humanities and Social Sciences will honor the outstanding accomplishments of its graduating seniors during a ceremony on Friday (May 16). The inaugural event will be held from 2:30-4 p.m. in the Criminal Justice Center’s Killinger Auditorium. During the ceremony, the college will recognize all of its graduates, as well as acknowledge honor program students, those graduating with honors, master’s students who have completed a thesis and the outstanding undergraduate in each department, according to CHSS administrative assistant Toni Abshire. The event is open to all CHSS graduates, their families and significant others, and a reception will follow in the lobby area. The CHSS commencement ceremony, which will be combined with the College of Business Administration, will be held at 10 a.m. on Saturday (May 17). For more information, contact the CHSS at 936.294.2200 or chss@shsu.edu. Graduate students in Scott Kaukonen’s creative writing workshop will share their accomplishments from the semester with a pair of readings on Monday and Tuesday (May 12-13). Both events will begin at 6 p.m. in the Wynne Home, at 1428 11th St.
Monday’s readings will feature the works of Amanda Nowlin-O’Banion and Drew Lopenzina. Nowlin-O’Banion, a Huntsville native who currently teaches creative writing at Texas A&M University, is the winner of the Tex Emerging Writer Award, was nominated for Best New American Voices 2006, and has published fiction in The Dallas Morning News and Conversely. On Tuesday, students in the English department’s master’s program will share their works. These readers include Joshua Bowen, Melanie Sweeney, Dana Allen, Kimberly Ferguson, Julia Guthrie, and David Sweeten. Readings will include both fiction and poetry and are free and open to the public. For more information, contact Kaukonen, assistant professor of English, at kaukonen@shsu.edu. 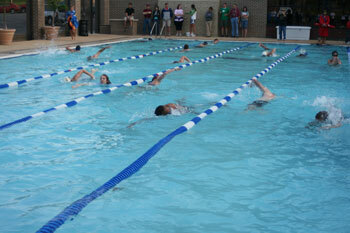 Participants of all ages 'tri' the 300-meter swim during the Rec Sports department's inaugural "Just Tri-It" triathlon on May 3. Sixty-seven swimmers, bikers and runners tested the waters for the Department of Recreational Sports’ first "Just Tri-It" Triathlon on May 3. SHSU student Ray Venegas and community member Amanda Seholm were the overall winners of the 300-meter swim, 10-mile bike and two-mile run with times of 50:03 and 57:34 respectively. Winners by age group were as follows: Richard Renteria, 17 and under; Laura Dokupil and Michael Deane, 18-24; Angie Burns and Simeon Hughes, 25-29; Blythe Ernst and Tim Cockerham, 30-39; Nicole Pottberg and John Faillace, 40-49; Sharon Lynch Philip Swicegood, 50-59; John De Castro, 60-69; and Anne Sigler, 70-plus. In addition, relay team winners included Frank Brown and Sidney Brown, co-ed; and Linda Debaugh, Lisa Hatchett and Deidre Hinze, all-female. SHSU students debated various aspects of Qatar with other schools, representing other Arabian countries, during the Bilateral U.S.-Arab Chamber's first Arab Model League conference April 4-5. Eight SHSU students recently converged with students from other universities in Texas to discuss emerging issues in Arabic states during the Bilateral U.S.-Arab Chamber of Commerce’s first Model Arab League. Held on the University of St. Thomas’ campus April 4-5, the conference assigned teams from different schools to represent panels dealing with foreign, educational, social and environmental policies. By debating these issues, students “gain a better understanding of the Middle East and Northern Africa,” as they have to be “well informed about the policies of the countries they are representing,” said Yasser Derwiche Djazaerly, assistant professor of foreign languages, who served as faculty adviser for the league. SHSU’s team, representing Qatar—a small peninsula country in the Arabian/Persian Gulf—was comprised of students from Djazaerly’s Arabic classes, a political science major and a business major, some of whom are minoring in Middle Eastern Studies, a newly established minor. Students Sarah Lisenbe, Nick Stevens, Amy Fancher and Lindsay Peterson received honorable mention for being outstanding delegates, with Alyx Stanczak and Fancher serving as vice-chairs for their councils and Stevens serving as parliamentarian. 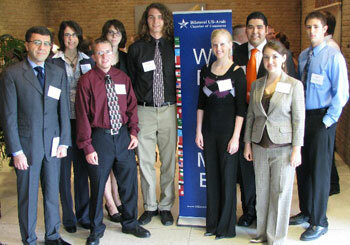 Other student delegates included Mario Diaz, Jacob Olive and Greg Twidal. Students interested in participating in next year's conference, which is also expected to be held in April, should contact Djazaerly at yasser@shsu.edu. Nathan Lee is a Sam Houston State University senior who is not only president of Phi Theta Kappa and the Golden Key International honor societies. He is also a volunteer for the Huntsville SAAFE House (Sexual Assault and Abuse Free Environment). "Through volunteering at the shelter Nathan saw a great need for playground equipment for the children--and he sprang into action," according to the Spring 2008 SAAFE News publication. Nathan made a call to the Huntsville Home Depot to determine how much money he would need to raise to purchase equipment for the playground. "Much to his surprise, the answer was not a dollar amount, but a very generous donation made by Home Depot," the newsletter continued. "They donated the playground equipment, the supplies needed to install it, and the labor. They also shaded an existing picnic area so the moms could be comfortable outside while watching their children play." Sissy Johnson, dance program secretary, said the faculty, staff and students in that department are especially proud. "He embodies the motto of our university ("The measure of a Life is its Service. "), she said. Three faculty members in the family and consumer sciences recently discussed “A Century of Change” during the Texas Association of Family and Consumer Sciences’ 90th annual meeting in Addison. Assistant professors Claudia Sealey-Potts and Paula Tripp presented their research findings from their “Consumers’ Knowledge and Perceived Understanding of MyPyramid 2005: A Challenge for Nutrition Educators in Texas” study, conducted with graduate students in the department. Department chair Janis White and Tripp also reported on “Secondary Teachers in Texas: Current Projected Need for Personnel,” a study carried out as part of grant project they manage. Attending the “Technology Excursion…A Century of Change” conference were other higher education faculty and administrators, as well as Texas AgriLife staff along with business and industry representatives. Serving as one voice for the family and consumer sciences profession within the state, the TAFCS works to improve the quality and standards of individual and family life through education, research, cooperative programs, business and industry, and public information. Family and friends of Bearkat Learning Community members gathered on April 26 for a day of lunch and recognizing members' "outstanding achievements." Bearkat Learning Community members and their friends and family recently celebrated their achievements over the past academic year with a day of activities. The “BLC Friends and Family Day” included a luncheon in the Student Advising and Mentoring Center, followed by a program in Academic Building IV’s Olson Auditorium, where students were recognized for “outstanding achievement,” according to Bernice Strauss, SAM Center director of academic support programs. During the luncheon, on April 26, students also showcased their talents for attendees. Participants included Benjamin Dryden, who played guitar; Mari Petteway, who sang; Shellsy Malveaux, who twirled; and Bethany Weinfus, who acted as a sign language interpreter. “Friends and Family Day” is an annual event for Bearkat Learning Community held at the end of spring semester as a way to recognize student accomplishments, according to Strauss. “This year BLCers had the highest GPA (grade point average) in the fall semester of any previous years, with a mean of 2.71,” she said. Nineteen percent of SHSU’s Ronald E. McNair Postbaccalaureate Achievement Program scholars will be attending graduate school by the fall, surpassing the program’s goal. Designed to increase the representation of first-generation, low-income, and ethnic minority students in doctoral programs, as well as the number of doctoral degrees conferred to these students, the McNair program will have 10 students enrolled in doctoral programs across the country from the 2003-2007 cohorts, according to program director Lydia Fox. Among those who will be pursuing doctoral degrees beginning in the summer or fall are Angie Cartwright, in counselor education at SHSU; Frances Fennessy, in composition at Indiana University of Pennsylvania; Elizabeth Jackson, in history at Indiana University; Geraldine Johnson, in counseling psychology at Texas A&M University; Jason Randall, in the University of Connecticut’s physiology and neurobiology department; and David Sweeten, in English at Texas Tech University. Those currently pursing a doctoral degree include Hector Esparza, in criminal justice at SHSU; San Juanita Garcia in sociology at Texas A & M University; Henry Pittman, in counseling studies at Capella University; and Ryan Williamson, in neuroscience at the University of Texas Southwestern Medical Center at Dallas. Other McNair scholars currently enrolled in professional programs include Donna Henley Jackson, enrolled in a doctor of dental surgery program at Howard University; Carlye Schulte, enrolled in a medical doctorate program at University of Texas Science Center of Houston; and Kathryn Liptrap, enrolled in a juris doctorate program at the University of Tulsa College of Law. For more information on the McNair program, call 936.294.3279, e-mail mcnair@shsu.edu or visit http://www.shsu.edu/~mcnair/.